NYC, 02/12/2019, 7:00PM. 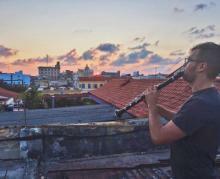 Colectivo: Music from Cuba and New York. The ensemble Tenth Intervention is equal parts presenting organization, music series and artist collective in New York City. As "ambassadors of modern music" (Interlochen Public Radio), they present bold and progressive concerts that explore the intersection of performance, experiential art, and its potential to reflect social issues. Founded in 2012 by violinist Hajnal Pivnick and composer/pianist Dorian Wallace, the group forms with the purpose of creating new work in a highly collaborative environment.